color: SOME SOLDIER'S MOM: Tag! You're It! Ok, Cathy over at Updates on My Soldier (http://thedailyblabs.blogspot.com/) tagged me with, "What's on your nightstand (she got tagged by Andi over at Andi's World (http://www.andisworld.typepad.com/). So, what's on my nighstand? A full bottle of water, a mostly empty bottle of water, a telephone, a lamp, a $1 bill, a pair of reading glasses (they're the dog's LOL), a clock radio, and a book on Arizona plants and weeds. And dust. 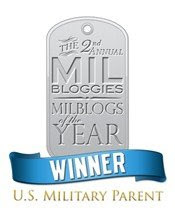 Army Wife over at ArmyWifeToddlerMom (http://armywifetoddlermom.blogspot.com/) and be sure to check out her BLOGGERS FOR BOOKS -- great idea!!! ok, having mercy on all others, that's my three "Tag! You're IT!" Update: I left out my good friend Stoic Mom over at Uncle Sam Ate My Baby (http://unclesamatemybaby.blogspot.com/) so I'm tagging her now... What's on your nightstand? 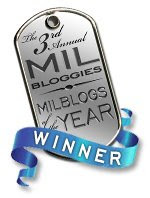 Hey thanks for mentioning the bloggers for books!! You and Andi tagged me on this, I will work on it tonight!!! I might just take a photo. I'll get on it soon!